Newburgh Free Academy ties nationally-ranked Martin Luther King 1-1 on Saturday, September 26, 2009 on Academy Field in Newburgh, NY. 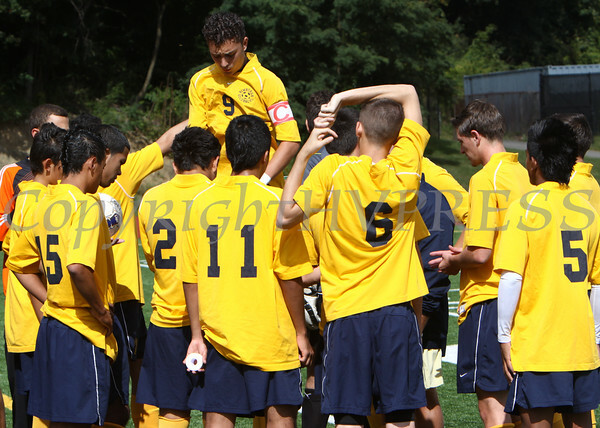 Newburgh Free Academy's soccer captain Alex Bramall(9) in the center of the team huddle prior to their match up against nationally-ranked Martin Luther King on Saturday, September 26, 2009 on Academy Field in Newburgh, NY. NFA tied MLK 1-1. Hudson Valley Press/CHUCK STEWART, JR.